Description: Online App Box can run lots of online applications remotely without having to install them. After you register an account, you can fast launch the remote application at the client side. It will map a virtual disk to help you easily upload or download data according to the menu Open and Save As a file in the online application. 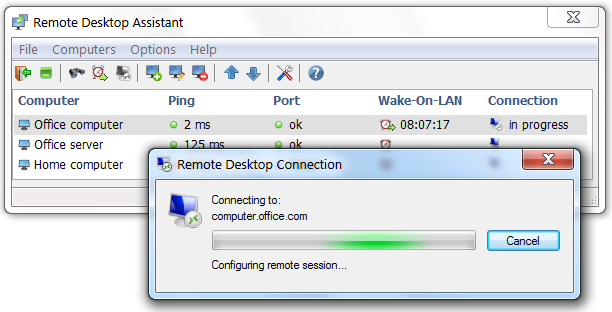 Description: Remote Desktop Assistant is a wrapper for Microsoft Remote Desktop Connection. It creates RDP configuration files and utilizes the Remote Desktop Client (mstsc.exe). Also, the program combines the features of a ping and port monitor, and a Wake-On-LAN magic packet sender, retrieving automatically MAC addresses of LAN computers. It manages multiple connections and allows to configure more RDP file parameters than the Remote Desktop Client. Description: The program receives magic packets and can be used as a Wake-On-LAN configuration troubleshooting tool. It allows to select local network adapters and create Windows Firewall exceptions. Requires administrator rights. 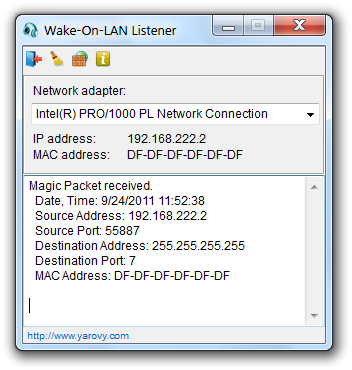 Description: Wake-On-LAN Sender can be used to turn on remote computers sending magic packets (UDP). This freeware utility supports SecureOn password and allows to identify MAC addresses of LAN computers. It can run hidden with command line parameters: WakeOnLan.exe /ComputerName, if the ComputerName entry is already configured. The software includes Wake-On-LAN Listener, a tool that can be used to troubleshoot Wake-On-LAN configuration.